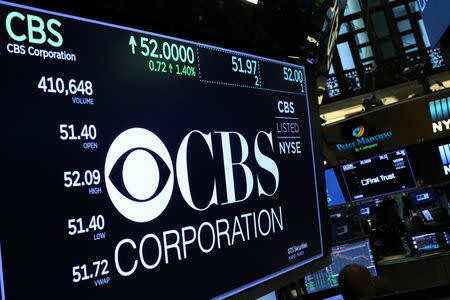 (Reuters) - CBS Corp's <CBS.N> quarterly results topped Wall Street targets and CEO Les Moonves delivered an upbeat message to investors about the media company's future on Thursday, without addressing allegations of sexual misconduct against him reported last week. At the start of an analysts conference call on CBS earnings that was also broadcast on business television network CNBC, the company said it would not take questions about Moonves' reported behaviour or its legal battle with majority shareholder Shari Redstone over control of the U.S. media group. Moonves said the company's digital business, which includes Showtime and CBS All Access streaming services, will grow to 16 million domestic subscribers by 2022, up from a prior forecast for 8 million subscribers by 2020. CBS, whose shows include popular sitcom "The Big Bang Theory," said advertising revenue during the second quarter rose slightly to $1.32 billion (1.01 billion pounds). Overall revenue increased to $3.47 billion from $3.26 billion a year earlier, beating analysts' average estimate of $3.46 billion, according to Thomson Reuters I/B/E/S. Moonves was quoted in the New Yorker as saying that he "may have made some women uncomfortable by making advances", which he called mistakes that he regretted immensely, but that he understood "'no' means 'no'" and had never used his position to harm anyone's career. The claims about Moonves also come as he is locked in a battle over control of CBS with the company's largest shareholder, National Amusements Inc, which is owned by Shari Redstone and her father Sumner Redstone. Moonves has opposed efforts by Shari Redstone for CBS to merge with media company Viacom Inc <VIAB.O>, also owned by National Amusements. Moonves, who has served as CEO of the media company since it was split from Viacom Inc <VIAB.O> in 2006, has resisted a deal to reunite the companies because he believes CBS's prospects are brighter without taking on Viacom's turnaround challenges.